Tower Millennium Pier is a pier on the River Thames, in London, UK. 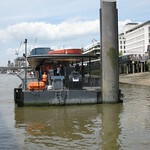 It is operated by London River Services and served by various river transport and cruise operators. The pier is close to Tower Bridge and is situated immediately adjacent to the Tower of London, next to the Traitors' Gate.